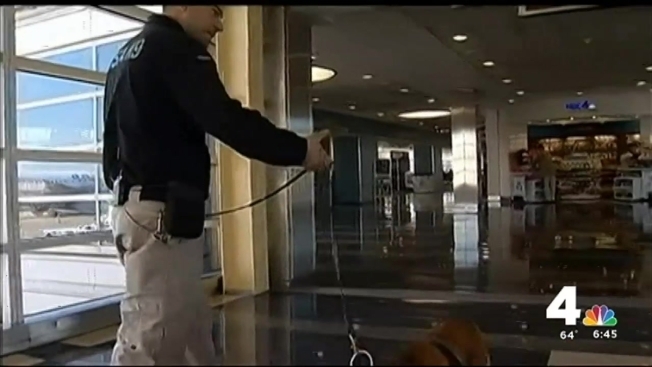 News4’s Adam Tuss spent the day nosing around Ronald Reagan Washington National Airport for an exclusive look at how the Transportation Security Administration is training explosives-detection dogs. Tuss was the first news crew member to act as a “carrier” of explosive material to test the abilities of bomb-sniffing dogs, according to the TSA. He served as a target for the dogs by transporting an explosive substance through the airport. At every turn, four out of the four dogs being tested picked up on the scent inside Tuss’ bag; regardless of whether he passed directly in front, walked around at a distance or sat far away from the dogs. Up against high-tech equipment like metal detectors, full-body scans and X-rays, a dog’s nose is often the best tool for sniffing out explosives. There are hundreds of explosives-detecting dogs and their handlers across the country. After hours, TSA agents take the dogs home so they are bonding and building a relationship 24 hours, seven days a week. Blue, Kkirby, Rufus and Rriverso -- who are named after 9/11 victims -- are the three black Labradors and golden retriever tasked with sniffing out the "bad guy." Breeds with floppy ears often are used as explosives-detection dogs because research shows that pointed-ear dogs, like German shepherds, are more likely to frighten people, according to the TSA. "The dogs are looking for anything that can go boom. And really what we do is we just associate those odors with their toy. So essentially, they are just looking for their toy," Timberlake said. "It’s a fun game of hide-and-seek to them, and they really hope that they find something everyday so they can have their toy."